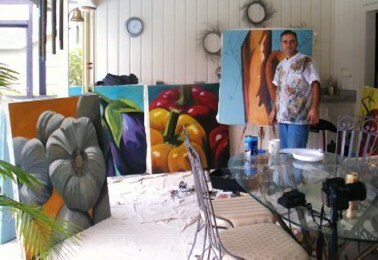 Jesse Demolli introduces his latest series of paintings, all studies in macro images of vegetables and fruit. Inspired by the abundant markets of Florida, the paintings explore shape and vibrant color on large canvas. The vegetables and fruit depicted in these painting reflect the grandiosity of Florida, home of colorful gardens, the fountain of youth, and larger-than -life theme parks.